The Victorian Transport Association (VTA) is supporting this year’s congestion-tackling Royal Automobile Club of Victoria (RACV) Redspot Survey. The survey enables motorists to report locations on the Victorian metropolitan and regional road network where delay and congestion frustrates them. "We are particularly interested in getting truck drivers to nominate what they consider to be the worst roads, either due to congestion, poor road design or road conditions, etc," VTA CEO Neil Chambers writes in a message to VTA members. "The survey instrument has a drop-down box to nominate the Mode of Transport, and "truck" is a mode that can be selected from the drop-down menu. 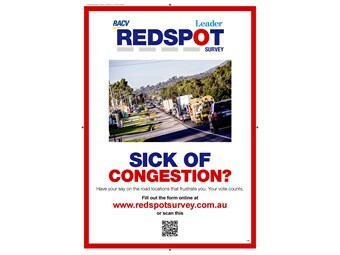 "Please use the attached Poster to bring the RACV Redspot Survey to the attention of your staff or colleagues. "The unique Quick Response (QR) Code contained in the Poster can be scanned by your personal communications device to allow you to complete the Survey from your mobile." The results of Redspot Surveys have been used by the RACV to lobby for much needed infrastructure investment to address Victoria's road network bottlenecks. "This year, the VTA will collaborate with the RACV to analyse and use the Survey results to lobby the Victorian Government regarding road spending priorities ahead of the State Government election in November 2014," Chambers adds.